It was the summer of 1158, and two rival navies faced each other across the Sea of the Hebrides; one led by Godred, King of Man, the other by his brother-in-law the upstart Somerled, Lord of Argyll. It was yet another clash between warlords in this most contentious of arenas where Gaelic Scotland met Viking empire; but the outcome of this battle would alter the balance irrevocably. For nearly 400 years Norwegian Vikings had first raided and then settled the Irish Sea, Hebrides and the Northern Isles, establishing a substantial territorial empire of sorts. Across this Norse world several large earldoms and semi-kingdoms had emerged by 1100, all vying for power and focused on controlling as much of the west as possible. The Kingdom of Mann, centred on the Isle of Man was a realm that included parts of Ireland and all of the Hebrides; and a force to be reckoned with. Nominally, the king was subordinate to the Crown of Norway; but Norway was far away, and often her kings were weak. So Mann, like her symbiotic twin in the north, Orkney, ruled the Atlantic with impunity. The perpetual thorn in their sides however was their near neighbour, the ever expanding Kingdom of the Scots. The first half of the 12th century had seen the rise of the Canmore dynasty; and no Canmore exemplified the authority and control of the state more than David I. As the younger son of Malcolm III he’d been brought up as a hostage in the court of William II of England for his father’s good behaviour. However, David ingratiated himself into the Anglo-Norman world and learned its philosophy on kingship and nation-building; and learned well. By the time he reached maturity he was the perfect image of a feudal lord; and following his brother’s death he headed north to claim his throne. Across Lowland Scotland he established Royal Burghs, built cathedrals and monasteries, and made the native nobility from the Tweed to Caithness part of a structure of obedience. In a stroke he swept away the essence of the old Celtic aristocracy, it was quite the coup. David was an astonishing monarch, perhaps the greatest in Scotland’s history. He extended his authority south into England, almost to York and elevated St Andrews to an archbishopric. It is a spectacular reign. He also recognised good allies when he saw them, and Somerled was top of the list. 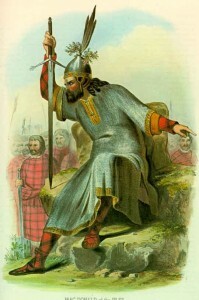 Somhairle MacGillebride, or Somerled, was born in the Norse-Gael world of Argyll early in the 12th century. He was the son of a Gaelic nobleman and a Norse mother, a typical union in those days. Somerled means ‘summer wanderer’ and is a purely Viking name; yet for all that, his passion and drive was entirely Gaelic. His father Gillebride, who for whatever reason had been robbed of his land by the Norse, was forced to Ireland; and the fire in Somerled’s belly as he returned to Scotland in the 1120s was to restore those lost estates. He was spectacularly successful, and so he kept going. By 1130 he was Lord of Argyll, Kintyre and Lorne; it was an incredible achievement. Holding the mainland was one thing, controlling the islands however was quite another. Ever the political barometer, David I began to suspect a sea-change in the west: this Somerled was no ordinary warlord. He may have been a gall-gàidheil, or Norse-Gael, but his loyalty was biased to his Scottish ancestry, so David began making friendly noises. Somerled wasn’t fighting to extend the authority of the Scottish crown, but pursuing his own agenda of conquest and political authority. That said, the Scottish king would make a powerful ally, and was far away enough so not to be a nuisance. For David, here was a loyal man who might overthrow the Norse in the Hebrides; and at no personal cost to himself. Both cut from the same cloth, the two men hit it off; and Somerled placed his sword in the king’s hand as his free vassal in the west. In 1140 the strongest warlord in the west was Olaf of Mann; and that year Somerled married his daughter Raghnailt. This gave him some control over the Inner Hebrides, and placed him in the heart of the Manx court. Over the course of the next decade he created lasting alliances, secured his powerbase, built a substantial fleet and moved his chess-pieces into position. In 1153 Olaf was killed by his nephews, and his son Godred became king. However there was discontent and his cousin Dugall Ottarsson planned an overthrow. He and his brother approached Somerled and asked for his support, which he wholeheartedly gave. David I had also recently died, and was succeeded by his 12 year old grandson, Malcolm IV. There was a scramble at court between various factions looking to control the boy. So, with division in the east and internal strife in the Isles, Somerled saw a chance to further his own ambitions, and went to war. A showdown was looming, and the future of Viking Scotland hung in the balance. In early January 1156 the two fleets met off the south coast of Islay, and Somerled attacked. The Battle of Epiphany, as it is called, was inconclusive; so the two leaders sat down and reached a compromise agreement. Somerled would have the islands of Argyll including Mull and Islay, while Godred would keep the rest including the Western Isles and the Isle of Skye. But it was an uneasy peace, and two years later they were back at it again with a second sea battle. This time the result was in no doubt: Somerled had smashed the Manx fleet, and Godred fled the scene. Somerled’s empire now stretched from Lewis to Man, and he styled himself as the ‘King of the Isles’. Nominally he held the islands from the Norwegian Crown, but in reality he ruled as a free prince, and gave his loyalty to the Scottish king. That loyalty did not stretch to royal advisors, and one family in particular – the Stewarts were flexing their own muscles and encroaching into Somerled’s mainland territories in Argyll. So, in 1164 he mustered an army to take on the Stewarts in their homeland of Renfrew. Little is known about the Battle of Bargarran, except that Somerled was killed or assassinated and the Stewarts were victorious sending the Islesmen fleeing. With the mighty Somerled dead, Godred, and probably with the aid of the king of Norway seized the moment and launched an attack against the Isles, and took back control. As per the agreement, Somerled’s descendants, the MacDonalds and MacDougalls were granted the islands of Argyll, while Godred and his descendants governed Skye and the Outer Hebrides; all theoretically under the Norwegian Crown. The MacDonalds however gave loyalty to the Scottish Crown for their mainland processions, and in reality this extended to the islands as well. That said, they like Somerled before them did so free and not as feudal vassals. They would style themselves the Lords of the Isles. By 1200 authority in the west and Inner Hebrides had shifted to Scotland, and was extended to Skye by mid century leaving only the Outer Hebrides. Throughout the 1250s and 60s Alexander III launched attack after attack throughout the Hebrides, and Norse authority slowly ebbed. Finally, in 1263 he defeated the Norwegian king, Haakon IV at Largs. 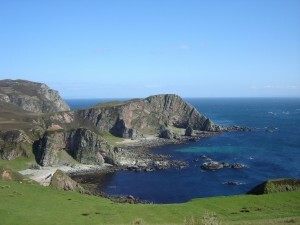 At the subsequent Treaty of Perth, signed in 1266, Norway relinquished all claim to the Hebrides. The Age of the Vikings in the west, which had lasted for 400 years, was over. Now only Orkney and Shetland remained.